The Rebel Ridge Guest House overlooks Bear Basin Valley with stunning views of the Sangre de Cristo Mountains to the west and the Collegiate Peaks to the northwest. 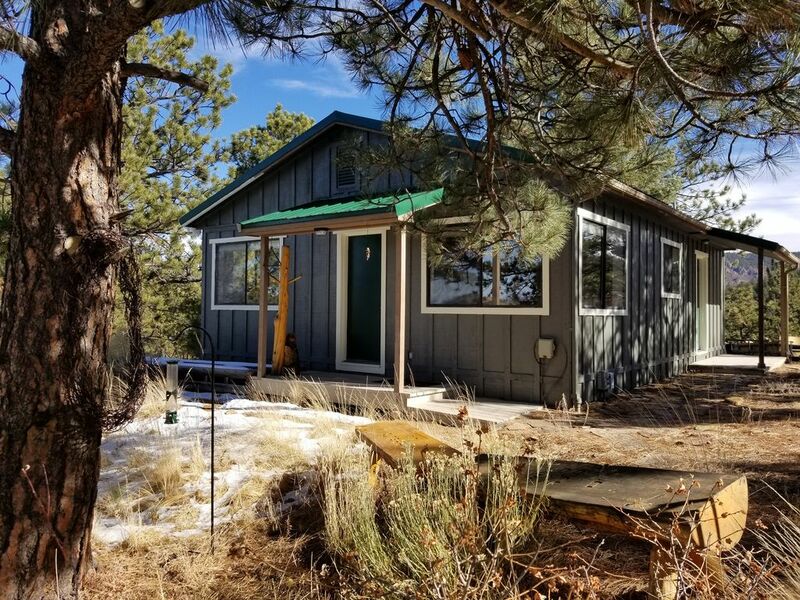 Located just 11 miles east of the picturesque town of Westcliffe, CO, this convenient location offers easy access to the Sangre de Cristo range and is just minutes away from fantastic hiking in the Wet Mountains. An ideal getaway spot and a great basecamp for all your mountain adventures. Rebel Ridge Guest house sits atop Tonso Peak on 70 acres of pine and aspen forest. This is a mountain setting yet very accessible. We are located just four miles from paved road and accessed via county-maintained roads, making year-round access one of its best features. Need more space? A second house on the property is also available for rent separately on VRBO. Look for the Bear Basin Mountain House listing. There are two houses on this property and I would like to keep them both rented as much as possible. The houses are about 50 yards apart and share a parking area. If you absolutely do not want to see another human being during your stay please let me know this when you book and I will gladly block the dates for the other house. On the other hand, if you are more social and would not mind saying hello to other guests in the driveway you need not do anything. I will leave the dates open for the other house and it may or may not be booked during your stay. Guests will have access to the entire house and deck area as well as the forested grounds. Feel free to take a walk in the woods and enjoy the birds and wildlife that inhabit the area. There are closets in the bedroom for guest use. Help yourself to any of the food items and spices in the kitchen cabinets. I do not live on the property full time but will sometimes be staying in the larger house nearby while working around the property. If I am not physically present I will be reachable anytime if you have questions during your stay. Feel free to contact me at any time on my cell and I will do my best to assist you. Most people do not have good cell phone coverage at the guest house but can often get a text out. If this is the case you can text me and I will get back with you via text message. Please double check the address with a mapping application to find the house and realize that many cell phones will not have coverage once in the mountains. AT&T seems to be the only carrier with service in our area. You can also turn on wifi calling on your phone to access your cell service at the guesthouse. There are a couple of things you should know if you plan to book with us between Nov 1 - May 1. Our guest house sits at 8900 ft. elevation. Although we do not get lots of snow until spring, we often get a few inches at a time throughout the winter and while we do have road maintenance, it may be icy in spots and difficult or impossible for a rear wheel drive vehicle to make it up our lane. I strongly recommend you have a front wheel drive or four wheel drive vehicle to get here during the winter months. I want to personally thank you for booking our Guest House. I sustained a spine injury while serving in the Air Force from 2001-2006 and my physical limitations make it difficult to find work that I can do. Your patronage is vital in helping us make ends meet. My family and I are very grateful for your support. Phenomenal views, good road access, comfortable and quiet. Surrounded by natural beauty. Ideal location on 70 acres with easy access to Westcliffe and unlimited outdoor activities in every direction. Gas stove and portable electric heaters. Beautiful views and close to scenic highways! The cabin was stocked with amenities beyond our expectations! We cooked all our meals here and had no problems preparing the food since the kitchen is well stocked. Matt gave excellent driving directions to get to the cabin. We would stay again...and would like to come up during the summer to enjoy both seasons! Beautiful land and a cozy and well kept cabin! Matt is very responsive and helpful, easy to reach, and provided lots of trail and area info. The cabin is very comfortable - spacious while being cozy. Amenities are great, full kitchen and bathroom, big living room, and wonderful views. Great hiking trails and plenty of room to roam around and explore. Even the drive up from Pueblo is scenic and pleasant. Our first time stay at Matt's was perfect....the cozy cabin was decorated in true lodge style and appointed with all of comforts of home. It was everything we hoped for and more providing inspiring views from within the cabin and wonderful opportunity to ramble across its acres of natural beauty. Thank you for letting your cabin be ours...we hope to return soon. This was the perfect place to base out of for our weekend in Westcliffe while attending the High Mountain Hay Fever Bluegrass Festival. The guest house is comfortable, well-equipped, and situated among the trees with a majestic view. The peace and quiet was profound.